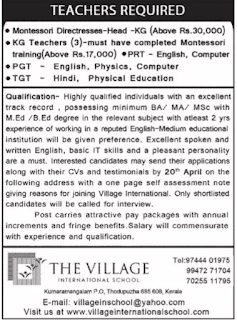 The Village International School, Kerala has advertised in THE Hindu newspaper for recruitment of PGT,TGT,Monte Montessori Directresses, KG teachers jobs vacancies. Interested and eligible job aspirants are requested to apply within 20th April 2018. Check out further more details below. Name of the School: The Village International School, Kerala. (a) Highly qualified indivuindi with an excellent track record,possessing minimum BA/MA/MSC with M.Ed,B.Ed degree in relevant subject atleast 2 yrs experience of working in a reputed English-Medium educational institution will be given preference. (b) Excellent spoken and written English, basic IT skills and a pleasant personality are a must. KG Teachers-(Above 17,000)Must have completed Montessori training. Post carries attractive pay packages with annual increments and fringe benefits. 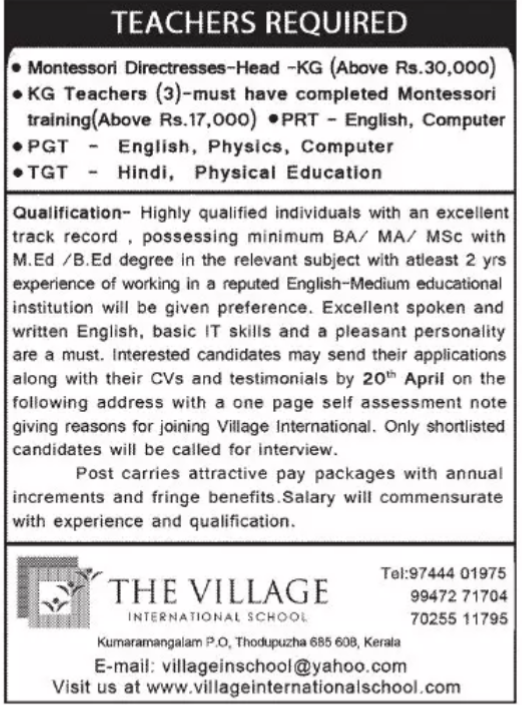 Interested candidates may send their applications along with their CVs and testimonials by 20th April on the follwing address with a one page self assessment note giving reasons for joining village international.only shortlisted candidates will be called for interview.